When you hear the word persuasion… what do you think of? Is it a pushy salesman? A political candidate? True persuasion happens in the sub-conscious. Persuasion is not the ham-fisted, pushy tactics that bad salesmen use. Furthermore, being persuasive or influential is not magic. Persuasion boils down to consciously or subconsciously influencing people’s minds, beliefs, and opinions. You can use your persuasive abilities to spread your message, ideas, or business. Today’s post is the first in a series of posts that reveal the persuasion tactics that influential, persuasive teachers use. These ideas will help you promote your studio and endear yourself to your studio families. Discover a tactic I’ve used in my piano studio to turn $50 into $2000 dollars over and over again; it’s an investment with a 4,000% return! This is Part #1 of the persuasion series. If you would like to be notified when the next post is published, click below. Why Does A Music Teacher Need to Be Persuasive? You want more students in your studio. You want your families to appreciate you. You want to inspire students to love and commit to music. You want to increase your studio income – perhaps even using my 9 step plan for making $10,000 per month teaching piano. Making progress in these areas can be traced back to using persuasion and influence. I began to experiment with persuasion and influence techniques in my own studio. I developed strategies and specific tactics after reading the best books written in the last 50 years on human psychology, sales, marketing, and social research. These books include Pitch Anything by Oren Klaff, How to Win Friends and Influence People by Dale Carnegie, and Thinking, Fast and Slow by Daniel Kahneman. 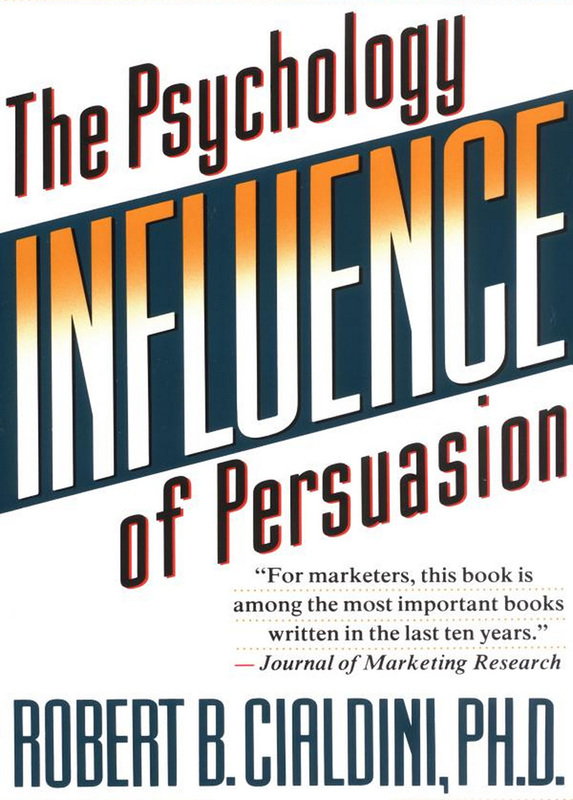 The most notable book is Robert Cialdini’s Influence. I’ll explain these categories over several blog posts. They are commonly accepted and understood by academics and lay people alike. If these categories are so well known, why do they work? They work because we humans are a mess! We act against our own self-interest. We make irrational decisions. We do things that we know will hurt us. It is because we humans have a long history of acting based on our emotions, not facts. If you want the leverage to build a powerful studio, a large studio, or an influential studio… you need to become a student of these influence triggers. How Persuasion Changed My Studio… And Can Change Yours, Too! Signing up new students used to be an uphill battle for me. People sounded skeptical when I talked about my studio. They suspiciously asked about my rates. They seemed pre-disposed to NOT sign up for lessons. All of that changed when I began to enact some of these influence triggers. They changed my studio, they changed my client relationships, and they changed my teaching income. I am not exaggerating when I say that I’ve heard people tell me that they are surprised that I “charge so little” (even though I’m the highest in my area). No one can quite put their finger on what it is… they just know something is different. These are signs of persuasion. They happened subconsciously through my marketing, my Web site, and words that I used in conversations by email and phone. The first of these influence triggers is the law of reciprocity. Simply stated, people will give after they have received. This is the principle of giving and receiving. And, to make this work… you don’t have to give much. Consider this study from 2005: Researchers tested how willing people were to complete a survey. He sent the surveys out to a large group of people. One-third of the surveys had no sticky note attached. Another one-third had a blank sticky note. Another one-third of the surveys had a sticky note with a short message asking people to complete the survey. The surveys with no note were completed 34% of the time. The surveys with a blank sticky note were completed 43% of the time. The surveys with a short message were completed 69% of the time! This is just one small example. Researchers have conducted hundreds and thousands of experiments about this topic. These experiments come from the field of business, marketing, social work, and activism. Another scientific study proved that people were more likely to buy a car if the salesman gave them a drink or a snack. How does this work for your music studio? Here are just three powerful ways that you can put the law of reciprocity to work for you in your piano studio. It is a sad (but true) fact that most piano teacher’s Web sites are terrible. Most music teacher Web sites are entirely “teacher-focused”. They are heavy on information (the logic side of your brain). They are very light on persuasive, influential stories. These sites ignore the emotional side of your brain that ACTUALLY makes decisions. Most teacher Web sites have a long biography about the teacher. They have a link to the studio policies. They have a dry, informational page about what methods or agenda the teacher has for their students. On paper, this seems right. This is logical. This is rational. But, the emotional brain doesn’t care about this information. The parent’s emotional brain wants to know if your studio can inspire their student. They want to know if you can help their child practice and love music. Send an email to families who have been taking lessons from you for less than a year. Ask them what their biggest QUESTION or FEAR was before beginning lessons. I work as a marketing advisor to music schools. I’ve seen the results of many surveys that ask this question. There are only a handful of powerful fears and frustrations that parents experience. After you receive the responses, compile a list of those questions and fears. Write an answer to each question or fear. Do this in your own voice and using your own intuition. Even just five questions with thoughtful answers (one to two paragraphs long) will suffice. You could write this in Word or Google Docs or Pages. Save it as a PDF. Give this away as a free download on your Web site. Then watch the law of reciprocity go to work. You have given them valuable information. You have proven yourself to be resourceful and knowledgeable about their struggle. Who do you think they will trust? If you help someone, they feel inclined to help you in return. It doesn’t matter that the gesture seems small (creating a guide). They feel gratitude and they will choose you over other options. Another way to “give-to-get” is to be generous through storytelling. In part one of my piano teacher’s Facebook guide, I gave a detailed storytelling strategy. The best studios use platforms like Facebook and Instagram to show what is happening in their studios. People care! They want to see student successes, recitals, and other studio events. Teachers and music schools are waking up to reality that this storytelling is valuable to parents. I’ve seen teachers successfully use these storytelling ideas from my guide to promote their studios. The smiles of dozens of children will do far more to persuade people to join your studio than a dry discussion of your “studio policy”. Weekly or bi-weekly videos of student performers are far more valuable to parents than your assurance that your studio is loved by many. Parents appreciate the time you take to tell the story of your studio. They will repay you by signing up for your lesson program. And, they will do it happily! Should we have strict or lenient piano studio policies? Should we use online ads to get new piano students? Should we force families to take lessons through the summer to keep their spot? Should we give a free trial lesson? The logical, rational answer is no. Why should we give away something so valuable (our time, our expertise) for free? Remember, emotion and influence beat logic every time. The time it takes to give our trial lesson is 30 minutes. Depending on your location, this could mean $20, $30, or $50 of your time. Well, if it helps you sign up a new student, I would say that it is a amazing investment. A new student could be potentially worth $1000s of income over many years. 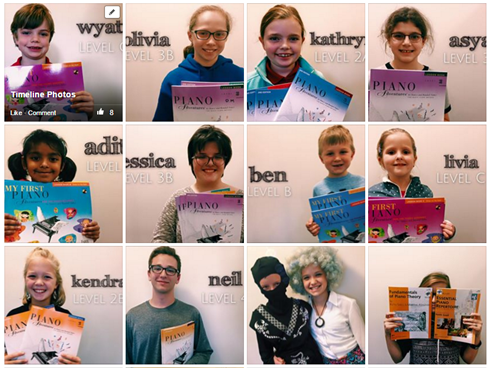 Trial lessons have been a standard practice for many piano teachers. You can give them now knowing that science is on your side. Parents appreciate the gesture, especially if you highlight for them just how valuable the gift is. Warning! Don’t Let This Backfire On You! 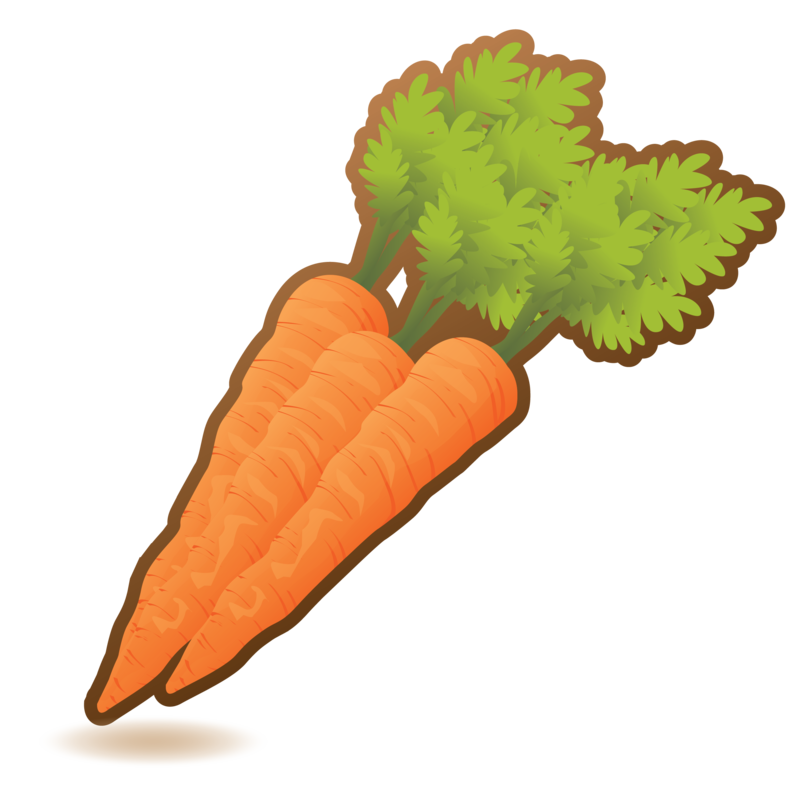 The story is told of a poor farmer who had a spectacular crop of carrots. They were unusually large and delicious. As a token of his love to his king, he decided to gift a large portion of his harvest to the royal palace. He presented the gift to the king’s court. The generosity of the farmer moved the king. He knew what a costly gift it was for the farmer to give away a large portion of his harvest. In response, the king gave him new fields for him to tend. One of the nobles of the court saw this. He schemed. The next day, the noble purchased a breathtaking stallion. The horse was ruinously expensive. He brought the stallion to court and presented it to the king. The king politely acknowledged the gift and returned to his business. The noble was dumbstruck. He waited for the king to reward him for his obvious generosity. He waited until the king acknowledged him. It’s a cute story. But, the moral is obvious. No one wants to be used. The intention behind your gift needs to be honest and pure. It is the only way the law of reciprocity works. You should give to HELP people. Help them make their decision to begin lessons. Help a child enjoy music. Help a parent make their life a little bit easier. Be generous. Be flexible. Be firm. Generosity should be your first concern. Money should be a distant second. If you use these “tactics” thinking only about yourself, it will come through. Do you love to help people? Do you like to serve people? If so, then this influence trigger will be easy to implement. Better yet, it will be enjoyable. It’s good for the soul, it’s good for your students, and it’s good for your studio. Which of these ideas will you implement in your studio? Let us know… your comments are important to us! Hi Daniel! I have a break this week and am finally getting caught up with all your blog articles. You nail specifics right on the head and I always learn so much from your posts. It gets me excited about trying a few new techniques in the studio. Thanks for sharing such valuable information and encouraging teachers to be bold in their business decisions. Hi Daniel, thank you so much for this post. Just a question about the law of reciprocity. As I’ve discovered, it definitely doesn’t work with everyone as a certain percentage of people are takers. Have you found this to be so in your studio and if so is there any way of vetting out these time wasters? I appreciate this blog. After years of running my own studio, including moving to a new city and taking a LONG time to get re-established, this particular post definitely reflects what I have found to be true. One of the challenges is that it’s easier to work that way when you are not desperate for students. That neediness comes through and can appear self-centered at the time when you most need it not to. It’s also good to remember to continue along those lines with new prospective students even when you have a large studio, as I do again now. Your mix of business experience with the particulars of running a music studio is refreshing and interesting to read. Thank you! You do bring up a very important point… one that I should be more careful to include in posts. It is much easier to be generous when your studio is bursting to capacity. 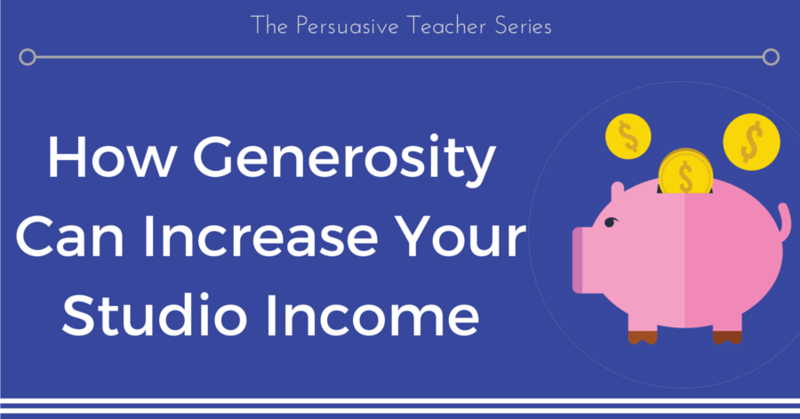 It is much easier to be generous when your studio commands a high rate. How do we get our studios to that place? A strong, functional sales funnel is the basis of confidence that you build from. Thanks for the thoughts, Jan. Thank you, Daniel, for your generosity! Some great reminders about giving and a lot of great tips for implementing alternative marketing. Thanks Pat, I appreciate your saying so!